French fries. Cheese curds. Gravy. We have much to learn from Canada. Two years ago Heather and I launched Portland Poutine. The site is our homage to Portland versions of Canada’s curious culinary treat, poutine. In the past year we’ve discovered, and reviewed, several new poutines. Most recently we stopped in at Foster Burger to try a couple poutines – the regular menu now features six different varieties! Last February, we finally made it to Gravy during a weekday lunch hour to try their gravy fries – which are not on the weekend brunch menu. In November we were delighted to discover that the new Hawthorne Hophouse offered poutine with the tastiest vegetarian gravy yet. And stay tuned! Several poutine purveyors are on our list, including Bunk Bar‘s Fries w/ Debris Gravy and Bunk Cheese, and the Gravy cheese fries with italian pork sausage gravy at the Sunshine Tavern. 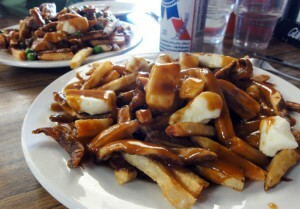 Whenever a new bar or restaurant opens in Portland my first query is whether or not they offer poutine. Thank you for reading, and please consider offering your own reviews – we accept contributions!